Newspaper Rock: Studi named "Great Western Performer"
American Indian actor Wes Studi to be inducted into Western ‘Hall of Greats’Actor Wes Studi is set to become the second Native American inducted into the National Cowboy & Western Heritage Museum’s Hall of Great Western Performers in Oklahoma City. The Santa Fe New Mexican reports that the “Dances with Wolves” and “The Last of the Mohicans” star will be inducted Saturday with the late-film noir actor, Robert Mitchum. The Arroyo Hondo resident is also known for his roles as the Apache leader in “Geronimo: An American Legend” and Navajo detective Joe Leaphorn in the made-for-TV movies based on mysteries by the late New Mexican writer Tony Hillerman. By Tom SharpeGrowing up in northeastern Oklahoma, Studi spoke only the Cherokee language until he went to boarding school. He remains an advocate of preserving native languages. After serving in the Army in Vietnam—in what he has described as a form of catharsis—he joined the American Indian Movement. That led to him participating in the Trail of Broken Treaties protest march and the occupation of the U.S. Bureau of Indian Affairs building in Washington, D.C., in 1972 and the occupation of Wounded Knee, S.D., in 1973. He returned to the Cherokee reservation in Oklahoma, attended college on the GI Bill, helped start a Cherokee newspaper and then ran his own horse ranch and became a professional horse trainer. It wasn’t until the 1980s that Studi turned to acting—live theater in Oklahoma, television and then his first feature film role in Powwow Highway, partly filmed in New Mexico. A small roll in the ABC-TV movie Longarm brought him to Santa Fe in 1988, and a few years later, he and his wife, Maura Dhu Studi, a singer and actress whom he had met in Los Angeles, decided to make Santa Fe their home. They lived in town for the first two years, then moved to Arroyo Hondo. He said he no longer keeps horses, but many of his neighbors do. “We’ve been here for 20 years,” Studi said. “The big reason is I like the area. I like the lack of humidity. My family lives in northeastern Oklahoma … and then my wife’s family lives in Los Angeles, and this is like halfway between the two. So it’s good logistics.”Comment: For more on Wes Studi, see Studi Films Diabetes Prevention Commercial and "Fashion Heat" at Indian Market. 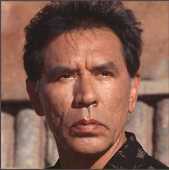 I met Wes Studi when I was a student in Oklahoma. He is a musician also. He is a gracious and intelligent man, something not every celebrity can be. He is funny, quick and speaks fluent Cherokee. Same impression when I met him a couple of years ago. Wes Studi, whose career has included memorable performances in the films “Last of the Mohicans,” “Avatar” and “Germonino,” will be the 2013 recipient of the Distinguished Artist Award at the fifth annual Tulsa Awards for Theatre Excellence. Studi will be honored during the awards ceremony, to be held June 23 at the Cascia Hall PAC, 2525 S. Yorktown Ave.